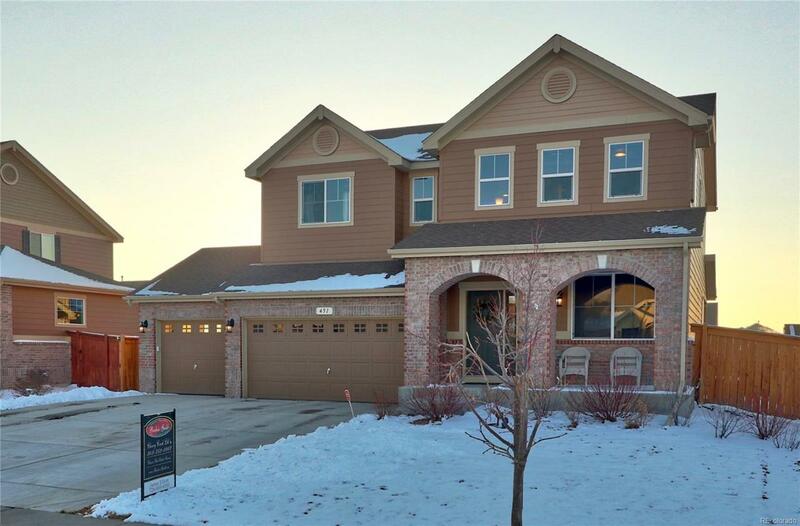 Traditions Neighborhood, a beautiful master-planned community, Amenities include a pool & clubhouse, close proximity to walking trails & parks w/convenient access to E-470, I-70, the new Aerotropolis business & housing development, Buckley, Southlands Mall & DIA. Beautiful 3 bed + study/3 bath, 2-story w/notable features including 3-Car attached Garage, Loft option, Main floor study, Master suite w/5-piece bath & walk-in closet, large covered back patio! Stunning kitchen w/slab granite countertops, slate stone backsplash, espresso finished cabinetry, stainless appliances including double ovens & gas cooktop! Open Greatroom design w/sunny dining space & living room w/gas fireplace. Garage entry w/coat rack & cubby storage, main floor built-in office nook & more. Spacious loft area w/many large windows providing a sun-drenched room! Full unfinished basement ideal for storage or future finish! Outdoor living space including covered front patio, large covered back patio & privacy fence!